The making of lipograms—writing that purposely omits a certain letter of the alphabet—has a long history in literature. 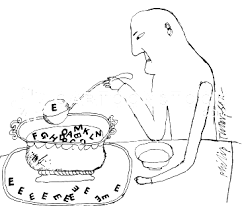 The word comes from the Greek lipo, meaning “lacking,” plus gramma, meaning “something written or drawn.” The first lipogram may have been an ode to centaurs by Lasus of Hermione (born 568 B.C)which the letter sigma was omitted, presumably because its sibilance was deemed unsuitable for poetry. Among one the earliest was Tryphiodorus, an Egyptian-born Greek, who around the fourth century A.D. chronicled Odysseus’s journey in twenty-four books, each of which omitted one letter of the alphabet. Gyles Brandreth, the novelty sweater wearing British broadcaster and author has rewritten several of Shakespeare’s plays, each without a specific letter: Hamlet with no I (“To be or not to be, that’s the query”), Macbeth with no A or E, and Othello without an O—the latter two feats most remarkable, inasmuch as the name of Macbeth, dragging its A and E with it, appears forty-two times in Shakespeare’s text, and Othello, enclosed by its two O’s, makes twenty-four appearances. You will probably want to rush right out to tell your friends that the oldest known lipogram now extant is a sixth-century history of the world, De Aetatibus Mundi et Hominus, by one Fabius Planciades Fulgentius. As with Tryphiodorus, Fabius’s scheme was to omit successive letters of the alphabet in each chapter, only fourteen of which still exist. Which by our opposition is subdu’d? Like Wright of Gadsby, poor old Perec also died young, at the age of forty-five.